It is a quote that comes down to us from Benjamin Franklin, who uttered the phrase in 1789. Taxes–federal, state, local, sales tax, property tax, gasoline tax, payroll tax, tolls, fees, taxes on capital gains, dividends and interest, gift tax, inheritance tax, and cigarettes and alcohol. There has even been a rising chorus that is calling for a special tax on junk food. Yes, Ben Franklin nailed it. We can’t escape taxes. If you have already retired, you are aware that taxes don’t end when retirement begins. For those who are nearing retirement, it is important to recognize, plan for, and minimize the tax bite that awaits. This is a high-level summary. It’s designed to educate and avert surprises. Planning for tax outlays doesn’t reduce the discomfort that goes with paying Uncle Sam. But preparation can reduce the tax bite and eliminate unexpected surprises. That said, let’s get started. 1. Estimated quarterly tax payments may be required. If you have never been self-employed, you are accustomed to having federal, state (if your state has an income tax), and payroll taxes withheld from each paycheck. When you stop working, there are no more W-4s to complete and no one is withholding taxes for you. But that doesn’t absolve you of your year-end tax liability. You can make estimated payments each quarter. You can also have taxes withheld from your pension, social security, or IRA distribution. If you have yet to file for social security, you may choose to have Social Security withhold 7%, 10%, 12% or 22% of your monthly benefit for taxes. Or you may decide not to have anything withheld. But make sure enough is withheld or your estimated quarterly payments are sufficient. Otherwise, you may face a penalty. Does it sound complicated? You don’t have to go it alone. Tax planning is a part of retirement income planning. If you have any concerns or questions, please reach out to us. 2. Social security may be taxed. If you file as an individual and your combined income (adjusted gross income + nontaxable interest + half of your Social Security benefits) is between $25,000 and $34,000, you may have to pay income tax on up to 50% of your benefits. If the total is more than $34,000, up to 85% of your benefits may be taxable. If you file a joint return and you and your spouse have a combined income that is between $32,000 and $44,000, you may have to pay income tax on up to 50% of your benefits. If combined income is more than $44,000, up to 85% of your benefits may be taxable. Additionally, 13 states–Colorado, Connecticut, Kansas, Minnesota, Missouri, Montana, Nebraska, New Mexico, North Dakota, Rhode Island, Utah, Vermont and West Virginia–tax Social Security. Failure to take the required distribution could subject you to a steep penalty. Required minimum distributions (RMDs) are minimum amounts that retirement plan account owners must withdraw annually starting with the year they reach 70½ years of age or, if later, the year in which they retire. However, if the retirement plan account is an IRA or the account owner is a 5% owner of the business sponsoring the retirement plan, RMDs must begin once the account holder is 70½, regardless of whether he or she is retired. Distributions are not required from a Roth IRA. The first payment can be delayed until April 1 of the year following the year in which you turn 70½. For all subsequent years, including the year in which you were paid the first RMD by April 1, you must take the RMD by December 31 of the year. The RMD rules also apply to SEP IRAs and Simple IRAs, 401(k), profit-sharing, 403(b), 457(b), profit sharing plans, and other defined contribution plans. If you expect to have large RMDs that could push you into a higher tax bracket, it may be beneficial to begin taking distributions prior to 70½. Or, you could convert some of your IRA into a Roth, which will help shelter gains and future distributions from taxes. You pay a tax upfront, but it’s one strategy that can help minimize taxes long-term. Downsizing can generate cash and reduce your daily expenses. But beware that it may also trigger a tax liability. If you’ve lived in your primary residence for at least two of the last five years prior to selling, you can exempt up to $250,000 of the profit from taxes if you are single and up to $500,000 if you are married. If you are widowed, you may still qualify for the $500,000 exemption. The sale may also trigger the 3.8% tax on investment income. It’s a complex calculation that can ensnare single filers who have net investment income and modified adjusted gross income above $200,000 and $250,000 for married filers. The decision to sell shouldn’t be strictly governed by the tax code. However, it’s important to understand the tax ramifications. Timing income streams might be beneficial if a sale will trigger a taxable event. There are other methods to lower your taxes, including charitable donations. How we structure retirement income, your investments, and distributions from retirement accounts can help to reduce the tax burden. Are You Sure You’re Saving Enough for Retirement? January 4, 2019 - Joshua Wilson, our CIO, shares thoughts on market volatility. Have You Seen Who Made the Best-In-State Forbes List? 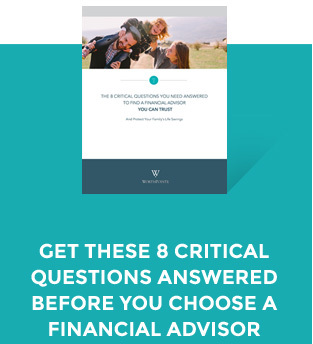 WorthPointe is a financial planning firm based in San Diego, Austin & Dallas-Fort Worth with CERTIFIED FINANCIAL PLANNERS™ who are credentialed, experienced and owners. We provide financial planning, investment consulting, tax planning, asset protection, estate planning, charitable giving support & more.